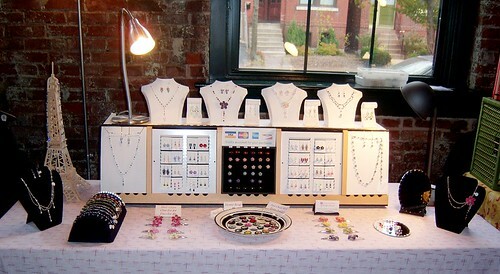 My set-up at Fall Artropy 2010 at Sqwires in Lafayette Square. I'll be there again on December 2! All of the white displays on top are made by hand from card stock and wire. The earrings hang on vent covers. The box-y thing is an old silverware display that I inherited from Candy Calamity, who was developing a new display.